While the importance of medicine can’t be discounted, human understanding does have its limits. Talk to doctors about physical and mental health, but when it comes to spiritual health, we need a second opinion. In this episode, host Curtis Childs and featured guests explore what eighteenth-century scientist and philosopher Emanuel Swedenborg learned during his mystical explorations of the afterlife. Join in as they delve into Swedenborg’s fascinating accounts of how the spiritual world can affect our health in the physical world. Our spiritual and physical selves are tied together through correspondences, which are connections between spiritual causes and physical effects. Swedenborg describes heaven as a universal human—one human form made up of infinite interconnected parts. We and our bodies are a microcosm of that spiritual reality, and our correspondence to it is what sustains our life. As he experienced the spiritual world, Swedenborg felt its connection to his own body and the way that his own organs reflected the functions of the greater whole. We may not be able to fully sense our own connection to heaven, but if we could, we might have an experience like Swedenborg’s, where we could sense which community in heaven is affecting us by the sensation in our body. Before we move on, a quick break for some fan art from a graffiti artist in Stockholm. Swedenborg’s opened inner senses allowed him to experience both heaven and hell. While contact with heaven gave him a sense of health and vitality, his contact with hell had the opposite effect. He had some truly horrendous experiences as he encountered various spirits dedicated to destroying different sacred things. A frequent contributor to the show, Dr. Jonathan Rose re-enacts Swedenborg’s experience of being attacked by evil spirits. 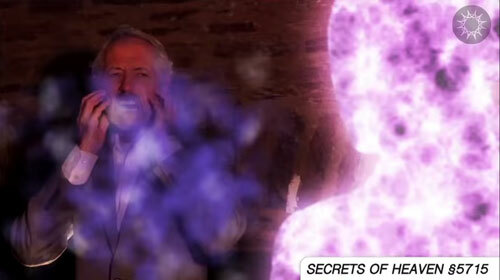 Swedenborg experienced physical symptoms from his contact with these spirits. Does that mean that disease comes from hell? This doesn’t mean that physical diseases do not exist, and it doesn’t mean that people who are sick have done something bad. It just means that whenever someone contracts a physical illness, the spirits that correspond to that disease may also be present. The struggle between good and evil has been going on for a long time, and it manifests in the battle between spiritual health and spiritual sickness. 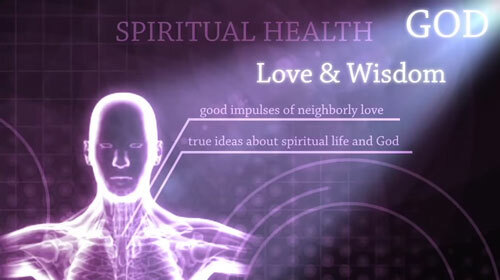 But what are spiritual health and spiritual sickness? They have to do with the state of your spirit. When God’s love is flowing into you and your mind is full of a desire to be loving to others, that’s spiritual health. Spiritual sickness, on the other hand, is when harmful impulses and self-justification lead you on the wrong path. We get from spiritual sickness to spiritual health through regeneration, a process of personal growth. Just as our spiritual being is constantly under attack by negative thoughts, our physical immune system is constantly at work to protect us from disease, as biologist Dr. Ed Higgins describes. You can think of a spiritual trial, or crisis, as your body’s spiritual immune system at work trying to fight off the influence of evil. It’s an ongoing, invisible battle. Swedenborg suggests that when spirits act on us spiritually or mentally, our minds create the physical sensations or symptoms in our body. This isn’t a unique idea—many cultures have systems of medicine based on the interaction between mind, body, and spirit. We can see support for this concept in modern medicine when we take a look at psychosomatic pain, with psychologist Dr. Erica Goldblatt Hyatt. So the battle for our spiritual selves could take the form of a purely spiritual or psychological trial—a sickness of the soul—or a mostly physical one where a person’s body becomes sick. We can also have experiences that are a little bit of both, especially if, for example, we approach a physical illness as a spiritual learning experience. Erica talks about the benefits of treating illnesses holistically, addressing mind and body. We have an obligation to take care of our body, which is like taking care of the soul. We take care of our souls by being useful in making the world a better place. That is our true goal. Some people believe that everything is physical and the spiritual doesn’t matter; some people believe the opposite. 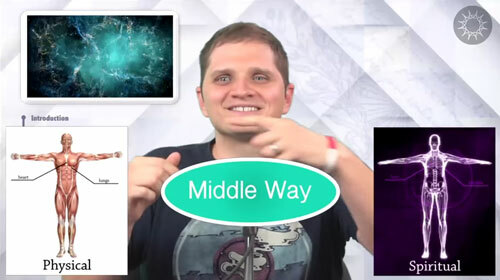 Swedenborg offers a middle way that combines the two perspectives. If negative thoughts come from the spirit world when we think them, then wouldn’t they technically be coming from us too? How does Swedenborg explain ghosts, spirits that stay on earth? Does Swedenborg talk about the relationship between emotional and mental attributes? Is worrying or being afraid a form of evil? Does Swedenborg teach us how to control worry and fear?